A garage door is one of the largest moving objects in your home, and is typically used every day, giving you good reason to keep it in proper working order. 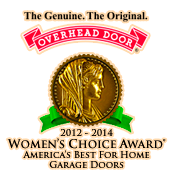 Overhead Door is dedicated to providing safe and reliable products that last for many years. We would like to offer the following practical tips for keeping your garage doors and openers in safe, proper working order. Test your garage door opener’s reversing mechanism monthly by placing a 2 x 4 board in the door’s path. If the door does not reverse after contacting the object, call us for a professional repair. Visually inspect your garage door each month. Look at the garage door’s springs, cables, rollers and pulleys for signs of wear. If any of these components appear damaged, contact an authorized Overhead Door Ribbon® distributor for inspection or repair. Use the release mechanism on the garage door opener to manually open the door using its interior or exterior lift handles. The door should lift smoothly with little resistance and should stay open around three or four feet above the floor. If it is difficult to perform this task, your door may be out of balance, causing premature wear. Call us for an adjustment. Never leave the remote control in the car or with a parking attendant. It should be treated like a house key. Always lock the door from the garage to the inside of your home for greater safety and security.Check to make sure your garage door is closed when you lock your entry doors at night.